(Tarboro, NC) Comfort and luxury. Versatility and ruggedness. A spacious yacht for your family, and a high-performance sport boat for you. The 320DC offers it all – with style. With rakish lines and an attention to detail, the 320DC is designed to look good while bringing you years of fun and dependable service. And, since it’s a World Cat, you can count on a smoother, better ride in virtually any conditions. At 32’2” and with a wide 10’6” beam, World Cat’s new 320DC is a full-blown offshore fishing machine with 500 quarts of insulated boxes, 279 gallons of fuel and a big 35 gallon livewell at the stern. But, the raised bridge deck has all the amenities of a waterfront luxury outdoor patio. The huge bow area has lounges galore. The dual air conditioned cabins host both a double berth and a full stand up head. All this is built into a catamaran hull design that smooths out big water while drawing just 16”. 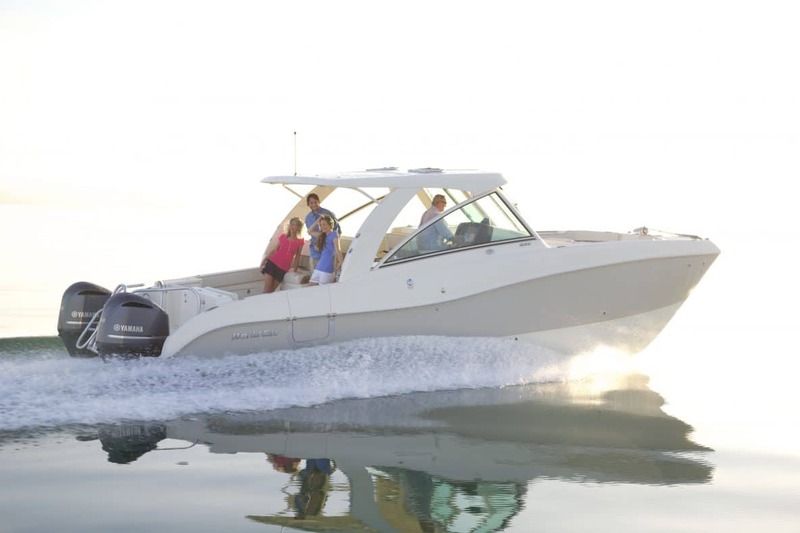 All in all, this is a boat that screams, “What do you really want to do today?” Family, friends, kids, fishermen, divers, the new 320DC has something for everyone to love. The 320DC has bow-to-stern innovations and features never seen on a catamaran this size. Starting with the bow area, the standard free-fall windlass has controls at the helm and at the bow. So, you can anchor over your favorite wreck with 300’ of rode and chain or find a secluded cove to enjoy the day. There’s even a fresh water washdown in the locker for cleaning up. The bow area is huge because the catamaran brings the big 10’6” beam all the way forward. Double-wide port and starboard lounges are upholstered in a fabric and faux leather vinyl combination that remind you of a luxury beach resort. The port side lounge has a handy dry storage area while the starboard lounge houses a huge 65” long insulated storage box. With the handy stowage inserts in the gunwales complete with their own mp3 outlets, kids of all ages may never want to leave the bow. Moving aft through the hardtop walk-through windshield reveals more of the premium fabric/vinyl selections with bolsters and big adjustable helm seat. Because the wrap-around windshield rises all the way to the hardtop above, there is a feeling like that of the enclosed bridge of a large yacht. The hardtop is filled with features like overhead lighting in both natural and red for night navigation. There’s even a flip down flat screen TV on the port side forward. But World Cat pulled out the stops with a six way adjustable, port side seat module that allows your crew to fold the bench seats completely flat for a 20 square foot sun pad. Or you can raise the forward backrest and it’s a lounge for two or more facing aft. Or, you can raise the aft back and face forward. Or, you can have two facing seats for two with a table in-between. Two sets of passengers can face forward. Or, both sets can face aft. You get the picture. The seating fits your concept of whatever you want to do on the water. Behind the helm that sports lots of electronics capability is another eye-opening innovation. The 320DC entertainment center is Corian-topped and comes complete with electric grill, food prep area and sink. It’s like you rolled a high-end outdoor kitchen onto the bridge deck. Custom-engineered drawers provide lots of storage for utensils and there’s even a trash receptacle right at your fingertips. The big 320DC continues to amaze with the room inside the big cabin consoles. Catamarans have their deepest parts of the hull on the outsides of the boat. This not only provides more stability at the dock and underway, it makes huge spaces available in the dual consoles. Unlike dual console monohulls that are shallow in the sides, the portside of the 320DC has over 6 feet of headroom in a compact cabin that has a two-sleeper double berth, a convertible aft-facing seat, fine cabinetry, flat screen TV, microwave, a teak and holly Lonseal sole and a 12,000 BTU air conditioner. In the starboard cabin, under the helm, you’ll discover an air-conditioned stand up head and shower with plenty of dry storage. The electric head lies below the flip up teak grate seat that’s convenient when showering. There’s even an overhead bar for hanging wet rain gear. In the stern area, the 320DC continues packing the feature list with a fiberglass side door to starboard aft of the entertainment center. Open it up for easy access from the dock or for a really big tuna on that great day offshore. With 40 square feet of open cockpit area, the self-bailing, non-skid aft cockpit is a fisherman’s dream with bolsters and rod holders and a 35 gallon raw water livewell in the aft port corner. Cutting board and tool holders are right where they are needed too. The transom door on the 320DC is offset to port and leads out onto the big extended swim platform between the engines. On those days when you need to work a fish around the props, you can move around the stern like a pro. But, you may not get the chance to fish because the divers and swimmers in your crew will love the big platform and husky dive ladder that puts swimmers aft of the engines. The dive and snorkeling gear is all below decks too. That’s because the starboard side stern seat with removable cushion reveals a “garage” for lots of gear and easy access to pumps and hoses. And just to make sure that everyone is clean and comfortable, the 320DC has a hot and cold aft cockpit shower. At 12,500 pounds dry weight, the 320DC is solid but transportable. With dual 300 horsepower four-stroke engines, she tops out at over 45 miles per hour and has a range of over 400 miles at a comfortable 24 miles per hour cruise. But, best of all, the 320DC is based on the proven 32-foot World Cat hull design that has earned a fan base worldwide. So, what do you want to do on the water today? Do we fish offshore, then grill our catch? Do we wakeboard, then picnic at that special spot? Do we run across the bay even though it’s too rough for monohulls? Maybe we go snorkeling, visit friends and then take a moonlight cruise. Maybe we do it all! The 320DC by World Cat is made for it. World Cat builds 13 models of catamarans from 23 feet to 32 feet at their 140,000 square foot facility in Tarboro, NC. With over 80,000 catamarans built, World Cat is the world’s largest builder of power catamarans.